My new years resolution, to blog more consistently, was a lovely thought. The blogging calendar I had drafted was paved with good intentions. Just not realistic. Between bridal shows, snow, a ribbon cutting (unfortunately I didn't think to take any photos of that fun night) snow and lots of new brides - life has been busy. Cheer up - Spring is almost here. This was a group effort in design but then all credit goes to Dad for his scroll saw skills. Now I don't have to say, "I'm in the unmarked grey building across from Ranly Cabinets." At the Galleria in Celina. Ava Lynn Creations made this beautiful tablescape. Venetian Gardens also played with table ideas. And lots of it. Shoveling seemed to cut into my work day. This is a pretty view from the back door. Nothing much happening here. We decided to not bother moving things back into this space. This spring (or summer) we'll replace carpet and paint! I've been mailing samples to out-of-town brides. This is a metal frame for a lampshade, stripped of it's former fabric (and rescued from the shed - I'd nearly forgotten about it). Pages of an old dictionary and a generous helping of Mod Podge gives it a new look. Curtains for my countertop made with garage sale hankies. I passed up my usual drive-by sausage biscuit and cheese at McD's for a delicious breakfast with Crafty Friend Kat. Green Thumb in between New Bremen and New Knoxville on Route 66. Notecards tied with bakers twine and a button. Cute gift for a cute little girl. A lovely vintage note from good friend Andrea (who does impressive calligraphy, as you can imagine). She's also a fabulous photographer. I'll share her photos of my shop in a separate post. Here is a photo of her taking a photo of a mirror, which shows me taking a photo of her. 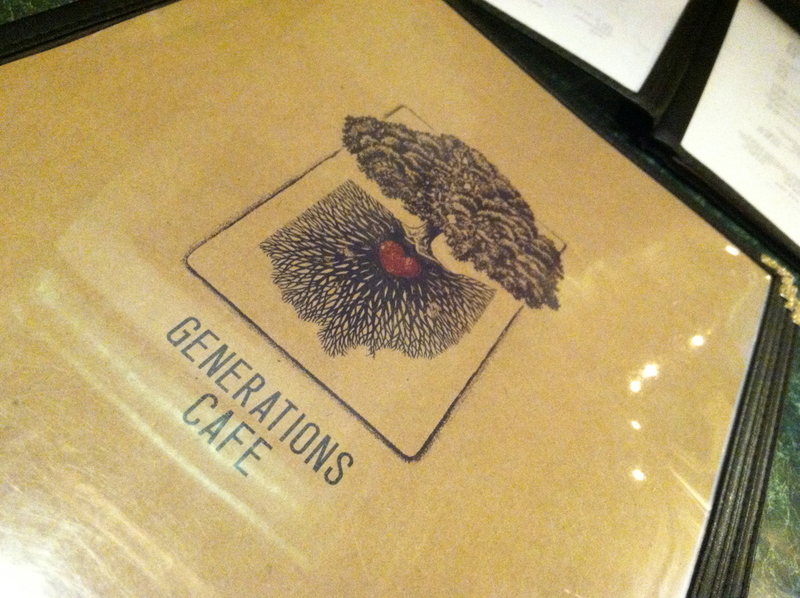 Generations Cafe, a somewhat new restaurant in St. Marys. Delicious grass-fed beef burgers and perfect fries. And a beautiful bar. The owners did extensive remodeling. It's got a fun, village pub like atmosphere. He looks deep in thought. His thick hair is gone. An at-home trim turned into an at-home haircut. Then when I pointed out a piece of hair that he missed it a faulty guard turned into a razor shave. He's completely bald now. Cute "campy" notecards for Brittany. She owns Living Music, a music therapy practice and she played beautifully at my ribbon cutting. We grabbed some friends and tried Mulligans Pub in Piqua. The main draw was deep fried bacon, which was delicious served with a side of sausage gravy. This little guy was all smiles and enjoyed himself and his food with abondon. I must brag about the pink bathroom one last time. Adam very patiently hung everything exactly to my specifications. The beautiful flowers given to me at my Ribbon Cutting are gone. Until spring - these flowers, made from old sewing patterns, will have to do.